"The great virtue of this wonderful instrument is ... its quality of revealing the personality of the pianist. It will preserve for later generations the art of the great pianists ..."
"I consider the Duo-Art one of the most wonderful inventions of modern times. By mechanical means it reproduces with a full measure of character and individuality the personal art of great pianists. The reproduction seems to be not a copy but the original"
High praise indeed for an invention less than 12 years old which was to disappear almost completely in less than ten. Where had it come from and where did it go? Before answering these questions it is necessary to make an important distinction. Up until 1904 there existed pianolas and player pianos. From as early as 1890 in the United States there had been machines which via the use of a perforated roll had in some way or another played pianos. These player pianos could play the notes, operate the pedals and accent notes. Speed and volume were dependent upon the operator or 'player pianist'. In 1904 the Welte-Mignon company in Germany developed and manufactured the Reproducing Piano. Like the pianola it played the piano but had the major advantage over its predecessor of being able to incorporate the 'touch' and 'feel' of the pianist. No longer was there any need for a human player to control speed and volume, with the Reproducing Piano these two variables were incorporated in the perforations of the roll. This was a significant and important development and constitutes the important difference between player pianos and Reproducing Pianos. Welte-Mignon did not have the market to themselves for long and in 1912 and 1913 the Ampico and Aeolian Duo-Art systems appeared in America. During a period of under twenty years the Reproducing Piano came and went. During its peak year of 1925 more than 192,000 instruments were manufactured by the Aeolian company in the USA with a total sales value in excess of $59 million. With revenues like this the Aeolian company was able to refine and perfect its recording technique and also record some of the greatest pianists of the time. So what went wrong? Between 1927-1928 the roof collapsed on Aeolian and all the other piano and player piano manufacturers as a result of three things. Firstly the advent of radio networks shifted the whole emphasis of domestic entertainment especially with regard to music making. Secondly the gramophone made significant strides in both disc quality and sound quality. Electrical recording was a massive improvement upon the old acoustic process. Thirdly, Al Jolson sang! The talkies hit the public and people flocked to the picture houses as the golden age of cinema began. As if this was not enough the following year saw the stock market crash of 1929 which just about finished off the Reproducing Piano. Rolls were issued in smaller and smaller numbers, prices plummeted and the last Duo-Art roll was issued in England in 1939. Since then piano rolls have generally been looked upon as mildly amusing side shows in the history of sound recording, largely due to the fact that players had not been maintained to proper operating standards and consequently the sound they reproduced appeared mechanical and unrealistic. However during their heyday no lesser critic than Ernest Newman writing in 1927 sang the praises of the Duo-Art system following a concert given in London during which the great pianist Cortot played "live" alongside a Duo-Art recording he had made. Newman was unable to distinguish between the piano roll and the real thing. "Now and again I would say to myself: 'This is Cortot' or 'This is Duo-Art,' but on opening my eyes I found myself as often wrong as right"
Interviewed about his Duo-Art recordings the great Leopold Godowsky enthused thus; "It is a truly remarkable experience to hear the Duo-Art mirror in every essential quality of tone and expression the Fantaisie (Chopin Fantaisie in F minor) as I played it a week ago! To think this same performance will be heard in thousands of homes, years hence - just as I played it at Aeolian Hall!" After a space of more than 60 years it is now possible to hear again on compact disc such great pianists as Godowsky, Paderewski, Busoni, Hofmann and Bauer as they sounded when they were at the height of their performing powers. Thanks to the expertise of Gerald Stonehill who owns the largest collection of Duo-Art piano rolls in the world, Nimbus Records is privileged to be able to present the Grand Piano Series. The aim of this unique series is to bring before the public the art of the great pianists who preserved their interpretations, genius and performing style through the process of making piano roll recordings for the Aeolian Duo-Art company. Many significant artists never made gramophone records or in the case of Busoni made very few and hated doing so! But they did make reproduction piano rolls. Thanks to Mr Stonehill and the late Gordon Iles, inventor and chief theoretician of the Aeolian company in England, it is now possible better to reproduce piano roll recordings made for the Aeolian company as long ago as 1914. This has been achieved through the design and creation of a 'Robot' which incorporates the ultimate Duo-Art technology in order to deliver historic performances exactly as heard and approved by the recording artists themselves. What makes Nimbus' Grand Piano series unique stems from the technical ability of the 'Robot' accurately to reproduce the nuances of the original performances, at concert levels. Duo-Art rolls feature a special set of perforations along both edges of the roll which can control up to 16 different intensities of hammer stroke. This, alongside the ability to vary the volume and intensity of the melody independently of the accompaniment and also independently of the sustaining and soft pedals, creates a series of tonal intensities and gradations beyond the capacity of the human ear to distinguish. Put simply this system does not sound like a machine playing a piano - it sounds like a live pianist. Not only that but because it is so accurate we can distinguish one pianist from another. Consequently this series enables us to hear a style of pianism which is long dead but which has its roots in the great composer-performers of the Romantic era. So, for example we are able to hear a recording of one of Liszt's Grand Etudes de Concert from a roll made in 1924 by Frederic Lamond who at the age of seventeen was taken to study with Liszt in Weimar. All the recordings in the Grand Piano series have been made at the Concert Hall of the Nimbus Foundation using a Steinway Grand. All recordings are fully digital. There are no extraneous noises no mechanisms whirring, no levers squeaking, just pure, amazing piano playing. The first Reproducing Pianos went on sale in Germany in 1904. As their success grew the Aeolian Company - the largest piano maker in America - recognised it as an opportunity to sell more pianos. The result of their unique development, unveiled in 1913, was an advanced digital system for recording the playing of great pianists - called the Duo-Art. Between 1915 and 1930 the Reproducing Piano was very big business. In its peak year, 1925, more than 192,000 domestic instruments were manufactured by the Aeolian Company in the USA, with a total sales value of $59,000,000. The Aeolian Company made every effort to perfect and enhance their invention, and throughout this period they kept the most famous pianists under contract; offering a balanced repertoire of smaller pieces, and, most significantly for us, larger works which the 78 rpm disc could not manage. There was never any problem about recording the activation of keys and pedals via electric contacts on the recording piano. The clue to recording expression, or "touch", lies in the hammer speeds. Because the piano has an escapement action, once the key is struck, the hammer moves irresistibly to its destination. There were four methods in use to ensure dynamic accuracy. Electric contacts at two points of the travel of each hammer measured its speed. A gramophone record was kept for reference. The recording engineer, sitting beside the pianist, entered his own notation into a console linked to the perforator. After two editions of the piano roll had been made at the factory, the pianist had to check all details before the third edition was published. Correspondence survives, which shows how seriously pianists approached this task. Reproducing Pianos are powered by an electric motor generating suction. This is piped to a tracker bar, pierced with one note for each piano key, plus further holes which direct the precise variations in air pressure to the tiny bellow operating each key. Playback, via a perforated paper roll, automatically controls the action of the keys, the synchronisation of the pedals, and the dynamic value of each note. The "Robot" used for this new series of recordings is a free standing construction which is pushed up to the keyboard of a piano; in this case a Steinway Concert Grand. It was completed in 1973, specifically to present uninhibited reproduction on modern grand pianos. Its expression decoder is a unique special construction of the late Gordon Iles, inventor and chief theoretician of the Aeolian Company in England. Other working parts were made between 1925 and 1936 in the UK and America, but are now adapted to the new model. A simple but significant advantage of the Robot is in its correct application of the side-shift "una corda" pedal. Even though the action of the una corda was accurately recorded in the Duo-Art process all built in mechanisms (built into the piano, that is) substitute an inferior "half-blow" effect. This compromise of a very basic element of tonal control was made in order to conserve function power in the domestic models. In this and all other aspects the Robot incorporates the ultimate Duo-Art technology in order to deliver historic performances exactly as heard and approved by recording artists in the Aeolian Hall in the first quarter of this century. In the Grand Piano series, there have been a number of revelations, not only for musicians ignorant of the historic performances locked away in reproducing-piano rolls - but surprises for many dyed-in-the-wool collectors of these same recordings. On the one hand, there are recordings of famous pianists who never made a single 78-rpm disc, such as Siloti, a pupil of Liszt. Then there are barely surviving records of Beethoven Sonatas by fabled virtuosi, who are only known for shorter pieces that would fit comfortably on the old 4-minute turntable with the usual sound of eggs and bacon frying scratchily in the background. In David Dubal's booklet accompanying Nimbus' release, NI 8818 Josef Hofmann playing Liszt and Beethoven, there is a different sort of surprise - a long-forgotten photograph of Hofmann with his invention for measuring the exact touch of the pianist. This device was in use in the Duo Art studios already in 1924, but was kept rather secret, since rivals were sniffing around, not far away, seeking a booster for their own production. It was not until 1929 , that The Journal of the Acoustical Society of America was able to publish a description of the 'Spark Chronograph for measuring Intensity of Percussion Instrument Tones' by Dr. Hickman of the rival Ampico system. But, by 1929, due to The Depression, the era of the Reproducing Piano was already in terminal decay. Hofmann liked to boast that he made more money out of his inventions, such as the windshield wiper, than he did out of his piano playing. Musically, though, his most important invention was the Touch Recorder. All the same, it has to be remembered that the Duo-Art editors could not rely exclusively on the Touch Recorder. It was only one of several elements that contributed to the (second stage of) roll editing - a very useful, indeed vital, check that the reproduction performance emerging from the roll of perforated paper truly corresponded with the combined dynamic notations made in the studio. Stage three was the checking of the result by the recording pianist. In the case of Hofmann, he was his own editor, and very content to verify stages two and three on his own. Percy Grainger too was insistent on being involved right through to production of the final result. So, it is very exciting now to rediscover the ancient photograph of Josef Hofmann with his Touch Recorder. Furthermore, in each of the splendidly informative booklets issued with the Grand Piano series CDs, David Dubal discloses little-known facts that give deeper insight into the performances enshrined in the Nimbus transfers. Aeolian Duo Art spent a tremendous amount of energy, time and money preserving the playing of great pianists for future generations (and, of course to make oodles of money selling their own pianos). Little did they imagine, though, the millennium-proof sound quality that is now available on compact disc - 80-odd years later! The Robot is sometimes referred to as the Stonehill-Iles Robot, since Gerald Stonehill and Gordon Iles both worked on its creation, but the greater credit must, according to Gerald, go to Gordon Iles, an exceptional genius, and, latterly, inventor and chief-theoretician for the Aeolian Company in London. It happened that the London branch of the Aeolian Company had come onto the Duo-Art recording scene six years later than New York. Intense trans-Atlantic training was required to bring London into line with the American standard of excellence, but it was impractical for William Creary Woods, the New York Recording Development Executive, to spend much time outside the States. Eventually, though, Gordon Butler Iles turned up at the London office. His impact can be appreciated if one just mentions the fact that Gordon single-handedly invented the Silloth pilot trainer during the war, made from reproducing-piano parts plus some further items of his own design, which helped to win the Battle of Britain by training pilots for all designs of British war-plane. The better-known Link trainer in America was built by the Link Piano Company, who sent their engineers to England to learn from Gordon how to construct such a device! When considering the objectives behind the construction of the Stonehill-Iles Robot, a number of factors have to be considered. In Duo-Art terms it has to be taken into account that the Aeolian Company had specially equipped Duo-Art pianos for public concerts - and for the recording artists to hear their own recordings for approval. Exhibitions were staged for example with Cortot playing behind a curtain and the piano playing in front, alternating with him, but visible on stage. Eminent critics could not tell which was which during the performance. However, there were extra perforations on the rolls, activating booster pumps, different from anything that customers could purchase. What was sold to the public was distinct for good reasons. Ladies, for instance, did not care to host fff concert performances in their boudoirs. What they had was splendid, but not 'the full Monty'. Moreover, the Duo-Art system requires increasing suction to deal with increasing loudness, and salon Duo-Art pianos did not have the capacity to deal with too high a demand. They were already using some of the available suction to run the roll-motor, (which incidentally affected roll speed on very long rolls, where torque was diminished as paper build-up increased the effective diameter of the drive spool). Salon grand pianos, one must add, use a half-blow for the soft pedal (like uprights) instead of the una-corda side-shift of a normal grand which would have required even more suction. Aeolian, New York, recognised the problems of volume production and of roll-speed weakness. In 1925 they installed a crash valve in American Duo-Art grand pianos to cope with fff demand. Then, in 1933, they substituted, in grands, electric (instead of pneumatic) roll-drive and less-wasteful suction design, combined with a slicker tracking device, to reduce distortion of rolls during playing. Nothing however was changed as far as pedal operation was concerned and in the aftermath of the 1929 Depression no more improvements were marketed. Since Gerald Stonehill already had amassed the largest collection of Duo Art rolls in the world, he came under great pressure to make archive recordings for the BBC, as well as LPs for commercial interests. He did the BBC work, but deferred making transfers to disc until he could overcome the limitations of the average Duo-Art piano. At the same time he was also asked to lend his pianos for public performance. But, every time the pianos were moved, they were damaged, and his services were not rewarded sufficiently to compensate for repairs. He soon acquired from America the latest mechanisms associated with the electric-drive super-models, and Iles and he discussed how to make a mobile Vorsetzer, which could resolve all the problems. Perfect reproduction had long been Gordon's main obsession, and his own piano already incorporated prototype new inventions of his own devising. Iles announced that he would co-operate in the venture on two conditions. 1. 'That the sky was the limit!' 2. That the "brain" of the virtual computer inside should be an entirely original design, to overcome variations from concert standards. So, they ended up with a decoder that could play any piano anywhere, that incorporated the 1933 roll-handling devices of Aeolian America, that used the pedals just as a live pianist does, and that had a computerised range of dynamics that could not vary with stretchy leather or variable springs, and that would be equally competent in ppp and fff passages. The first question that the Nimbus producers asked Gerald, when they heard The Robot, as he called it, was, "Why is it that one can hear the different tone of different pianists?" The answer of course was that all of these improvements made The Robot the Duo-Art reproducing piano par excellence. A pianist's tone is also, of course, heavily influenced by pedalling - and here, in The Robot, we had, uniquely, a mechanism capable of translating the pedalling instructions on a roll into the correct physical action of a grand piano. For twelve years The Robot made public appearances in the Festival Hall complex, promoted both by the Player Piano Group and by the founders of the Pianola Institute, since it gave support to demonstrations of comparative Reproducing Piano systems and subsidised the appearance of human player-pianists on stage. It was also called on by the Percy Grainger and other Music Societies to demonstrate the playing of their heroes/heroines. Understandably, there was disappointment when The Robot was withdrawn from this circuit, due to limitations of Gerald's own time and energy. But more conventional mechanisms were soon substituted by the organisers on stage, so that the promotions could continue. Eventually, The Robot re-emerged, making transfers onto CD for Nimbus. Now it was possible for a wider public to hear for themselves what had made The Robot such a feature on the South Bank stages. 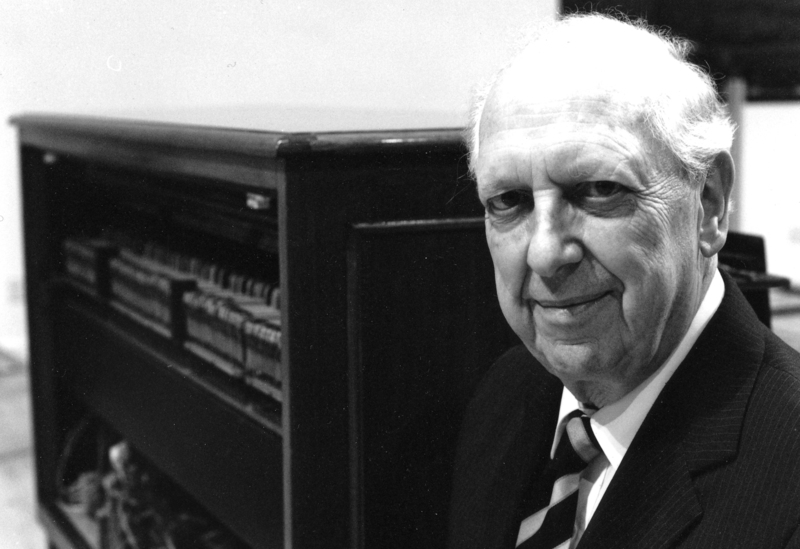 The Player Piano Group, in 1999, acknowledged the contribution that the Nimbus transfers had made to their speciality by conferring honorary membership on their onetime vice-president, Gerald Stonehill. Additional plaudits came from The Penguin Guide to Excellence in Recorded Classical Music, which cited some of the Nimbus transfers. In 1997 NPR's Performance Today had already nominated the Nimbus transfer of Debussy Piano Works (NI8807) for the Heritage Award (which honours the previous year's recording that most helps foster appreciation of classical music and artists).